Since 1980, rabbinic students at HUC-JIR/LA have enrolled in special classes to prepare them for visiting the sick (bikkur cholim) as one of a rabbi’s primary mitzvot. Students have also held clinical apprenticeships at major hospitals in Los Angeles, including Cedars-Sinai Medical Center, UCLA Medical Center, Santa Monica Hospital and City of Hope. The College-Institute is committed to training within the context of traditional rabbinic study. Occasionally, rabbinic students are joined in healthcare work by colleagues from the HUC-JIR School of Jewish Communal Service. In 1993, a dramatic development added to the quality of our programs. Judith Schindler, then a rabbinic student, was apprenticing at Cedars-Sinai, where she visited Irving “Red” Kalsman who had suffered a serious stroke. Mr. Kalsman was profoundly moved by his visits with this young student and in appreciation, decided to help the College-Institute advance this work. 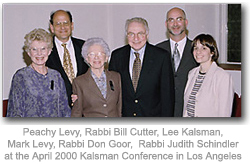 Mr. Kalsman and his wife, Lee, first funded enhanced health-related rabbinic training. The success of that initiative led to the April 2000 national conference “Re-imagining Illness, Re-imagining Health”, which led to the creation of a permanent endowment that today fosters the programs of the Kalsman Institute on Judaism and Health. Mr. Kalsman passed away shortly before the first conference to bear his name, but his legacy and spirit carry on. Lee Kalsman lead her family— her children and grandchildren— in the development of this center for public discourse and spiritual care, before she died in September 2003. With the support of this generous family, and the inspiration of Mark and Peachy Levy, the Kalsman Institute serves as a resource for the healing community and the Reform Movement. Rabbi Bill Cutter on the Institute’s origins. (click picture to view highlights).